The Doctor says my Mom needs ‘Assisted Living’, now what? The term ‘Assisted Living’ is often used by medical professionals as a broad description, simply meaning your Mom may need more help than she is getting. It may be time for Mom to move to a place where some of her daily needs could be more easily met, where there are people around to keep a closer eye on her, where she can more easily socialize with people her own age. That help can come in many forms and doesn’t necessarily mean a move to an assisted living facility. Unless your mom needs assistance getting out of a chair or bed or help getting to and from the toilet or needs the availability of nursing staff 24hrs a day, a move to an assisted living facility may be more than is necessary and with an average monthly price tag of $3628* a whole lot more expensive than some other less restrictive options. Home Health Agencies are a great solution if your Mom only needs help occasionally like assistance with a shower. If your Mom needs help with other IADL’s (Instrumental Activities of Daily Living) like preparing meals, laundry, housekeeping and transportation then making the move to a less restrictive, less expensive Independent Senior Living Community may be the best option. Independent Senior Living Communities typically offer all these services as well opportunities to participate in activities, outings, fitness programs and much more. With monthly costs up to 47% less than those of assisted living facilities you can save a significant amount of money. You could then use some of that savings to pay for some extra help from a Home Health Agency with a shower or maybe some help managing your Moms medications or other items as those needs arise. Independent Senior Living on its own or combined with Home Health could be the perfect answer to the concerns your Mom’s doctor may have. Whatever terms the doctor uses; more care, assistance, assisted living etc. you have choices. 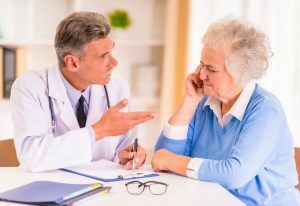 Do your Mom a favor and check into all the options before deciding to move her to an assisted living facility just because the doctor chose to use those particular words. *Median national average monthly cost for a 1-bedroom assisted living apartment.